The Kaduna State Government is concluding plans to ensure the success of this year’s edition of the National Festival for Arts and Culture (NAFEST) scheduled for 8th – 14th October, 2017. NAFEST is one of the major cultural festivals that serve as veritable platform for mobilizing Stakeholders in the Arts and Culture Industry where they interact to showcase talents and project the values of our heritage as well as develop the spirit of national identity and peaceful co-existence among Nigerians. 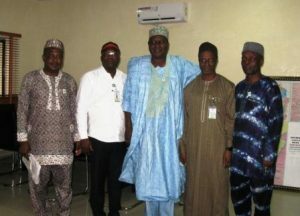 The Director-General of the National Council for Arts and Culture (NCAC), Otunba Olusegun Runsewe while paying a working visit to the Kaduna State Government to ascertain the level of preparation was impressed with the structures put in place by the state affirming his confidence in the State’s ability to deliver. Speaking during the visit, Otunba Runsewe thanked the Secretary to the State Government (SSG), Mallam Balarabe Abbas Lawal and the Commissioner for Youth, Sports and Culture, Hon. Daniel Danauta for their warm reception saying the essence of the visit was to ascertain the level of preparedness of the state on the forthcoming NAFEST which promises to host all the 36 states of the country including the FCT. Welcoming the NCAC delegation to his office, the SSG said he was delighted having the team in his office as the visit will further consolidate on the level of preparedness they had put in place. Runsewe used the opportunity to present some made in Nigeria tablet pouches and NCAC crest as souvenirs to the SSG and Commissioner of Youth, Sports and Culture. The highpoint of the meeting was a group photograph and handshakes.